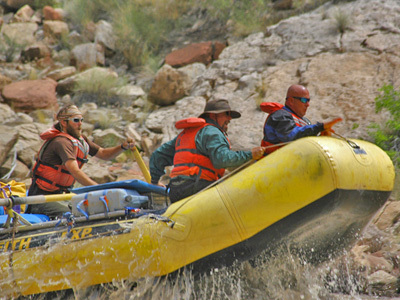 The 5 Day Sights of Cataract Canyon rafting trip will take you through a spectacular, remote section of wilderness in Canyonlands National Park by oarboat. This trip combines the serenity of floating through calm stretches of majestic red rock formations, incredible hikes to natural features and ancient Native American ruins, and the exhilaration of some of the most exciting whitewater in the United States. 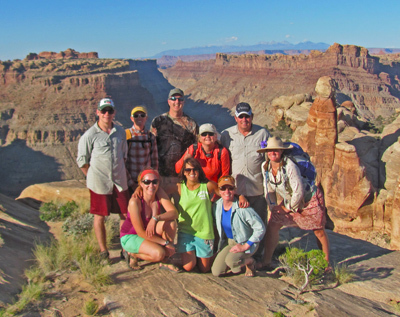 Come experience one of the most beautiful parts of Canyonlands National Park at the relaxing pace of the Colorado River while enjoying the camaraderie of fun and interesting people. Our five day itinerary gives us plenty of time to hike to incredible Native American ruins, explore secret canyons only accessible by river, and just relax and enjoy the beautiful surroundings. 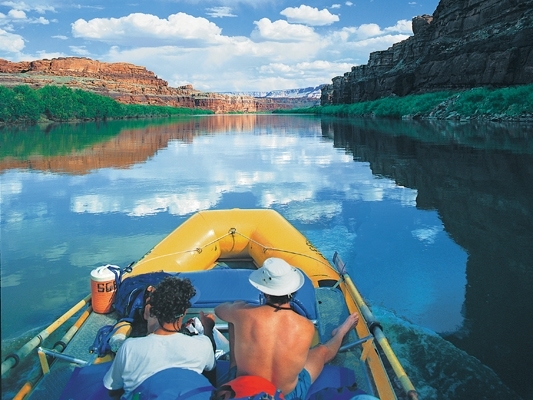 The oarboat, the traditional way to raft the Colorado River, lets you experience the wonders of Cataract Canyon firsthand without the noise of a motor. Between mid-May and mid-June, Cataract Canyon has some of the biggest and most challenging whitewater in the United States. The stunningly powerful rapids in these months are a thrill seekers’ dream! For those seeking more moderate excitement, we recommend waiting until July or August after the water level has dropped, as the rapids this time of year are fun rolling waves that are suitable for a wide range of travelers (and are an especially good fit for families wishing to raft Cataract Canyon). "We were in Eric's boat and found him to be courteous and knowledgeable, always on the lookout for points of interest, and he got us through the rapids in a way that was fun and exciting but safe too. We really enjoyed our time with him; he's an asset to your company. The meals were outstanding, all the guides very polite and accommodating to all, knowledge of area history, geology and water use issues was very interesting, great job on keeping everyone safe." Lemonade, Iced Water, and Gatorade: Coffee, teas, hot cocoa, and juice available in camp. Trip Deposit: $300 per person deposit required upon reservation. Full balance due 45 days prior to departure. Guide Gratuities by no means required but always appreciated by our guides. We recommend 10-20% of the cost of the river portion of the trip. Lodging and meals prior to or following your expedition (except where noted.) 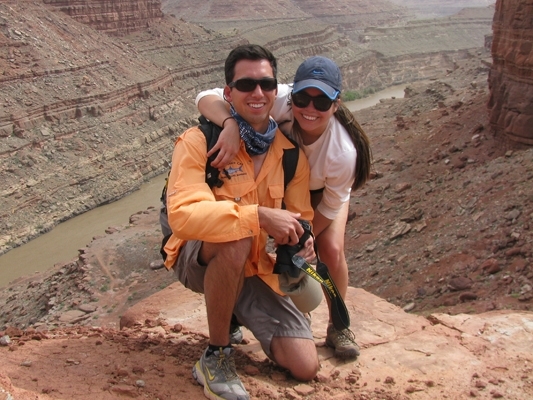 Click to see list of quality places to stay in Moab Utah. Day 1 This morning y ou will be transported from the Sheri Griffith Expeditions office to the Potash Boat Ramp on the Colorado River. You may catch a glimpse of petroglyphs on the cliff walls, dinosaur tracks on some of the roadside boulders or fossils in the rocks surrounding the boat ramp. Once on the river we settle into the boats and begin our journey down river through the heart of Canyonlands National Park. This morning guests may visit a petrified wood bed and will pass the Pyramid Butte. The canyon walls are a beautiful, deep red which contrasts beautifully with the pristine blue sky that will be your ceiling for the next 5 days. 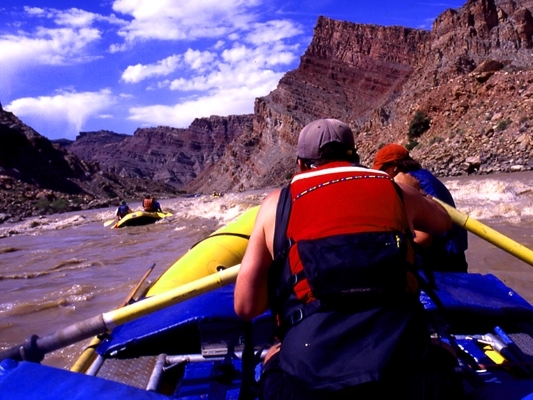 After lunch, we settle back onto the boats and continue downstream, where we will pass Tex's Grotto, where a Grand Piano is set up for concerts during the Moab Music Festival, and Dead Horse Point, where the movies Mission Impossible 2 and Thelma and Louise were filmed. We will pull off the river to camp for the night. After setting up their tents, guests can sit back and relax or hike the canyons while their guides setup the kitchen and dining areas. Swimming is also an option. Dinner prepared for you by your river guides. Meals are wonderful combinations that fit well into the atmosphere of your canyon dining room. 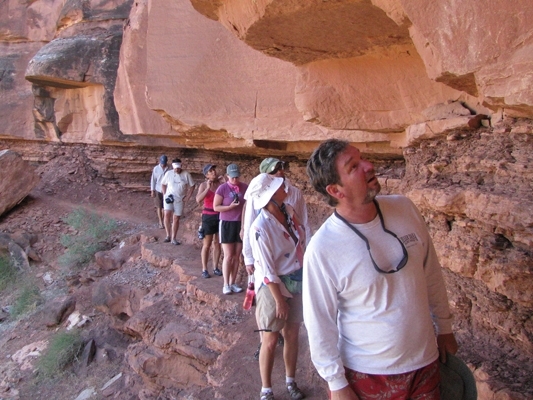 Potential Hiking Opportunities: Tex's Grotto, Little Bridges, Petrified Wood. Note: Meals are served from a set daily menu, but you are welcome to request, in advance, special dishes or tell us if there are particular things you would prefer not to have. Wake to the smells of fresh coffee and a delicious breakfast cooking in the morning After you eat, we will assist you in taking down your tent and in preparing for the day's journey. This morning we will pass Lockhart Canyon, where Butch Cassidy and the Sundance Kid used to hide their stolen cattle until they could move them to market. We will also see Indian Ruins at Lathrup Canyon. We'll pull off river for a healthy lunch and possibly a short hike. Vegetarian option is available with advance notice. This afternoon we will see picturesque Airport Tower, which rises nearly 1200 Feet above the canyon rim, and is long enough to land an airplane on. We will also see the Coffee Pot Ruin and the "Racing Stripe", a bright white stripe of Gypsum suspended midst the deep red sandstone that makes up the rest of the canyon. We will pull off river for another evening of big sandy beaches, exploration, contemplation and beautiful starry skies. After we assemble our River Side Oasis, you are welcome to sit back and relax or take a short hike up Indian Creek Canyon to see the waterfalls (spring trips only). Spend the evening in warm camaraderie as you relax and enjoy the desert wonders around you. Breakfast is served in your canyon dining room. Breakfast offerings will vary throughout your rafting expedition. Hot coffee, tea and chocolate are always available, as are juices, and fresh fruit. After breakfast, clients will board the boats and we will head down river. 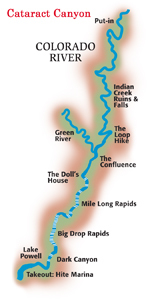 We may take the opportunity to participate in the Loop Hike, which takes us to the top of the ridge around which the Colorado River takes a four mile bend onto itself. You will be able to see both sides of the ridge from nearly 1000 feet above the river! Enjoy another healthy and delicious Lunch, served as you visit a large sandy beach alongside the river. 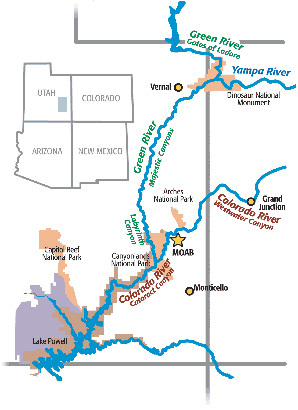 This afternoon we will reach the Confluence of the Green and Colorado Rivers. We now enter the true heart of Canyonlands National Park as we near the Confluence. If it has rained recently, the mixing of the rivers will be defined in brilliant swirls of red and green. After the Confluence, we will experience the first of the Cataract Canyon rapids, numbers 1 through 10. By now the river has doubled in size and force. The rapids are not huge, but will suffice in getting everyone good and wet before we pull off for the night. We may take a side hike to the top of the Dolls House. We will pull off river for an afternoon of hiking, swimming and yard games such as horseshoes or bocce. The crew will set up the camp as guests relax. Dinner will be served with the sound of whitewater in the background and blue skies overhead. 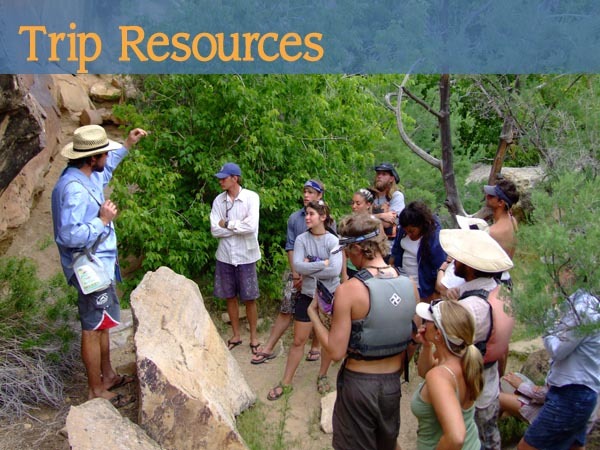 Guides will tell stories of early explorers and of more recent experiences in the rapids that you will face the next day. Tonight we will experience a night of peaceful camping and quiet anticipation. Fall asleep to the quiet sounds of river music: quiet splashing accompanied by the high tones of crickets and the low tones of nearby owls. This morning's fare is complimented by the sound of rushing water and the anticipation of a great day of running the famousrapids of Cataract Canyon. We will load everything back onto the boats and prepare ourselves for the exciting day at hand. This morning we will run some of the biggest whitewater in the Western United States (on trips during May and June, later season trips ~July and August~ have smaller rapids). Rapids whose names are almost as intimidating as the whitewater itself: Big Drop 2, North Seas and Capsize. Everyone will be thoroughly soaked as we take a break at midday for lunch and to catch our breath. Stop for Lunch and for some "Land Time". While the guides prepare lunch, guests are welcome to explore the canyon a bit or watch as others run the big rapids they have just been through. Once we have finished with lunch, we get back on the boats and head into the big whitewater. This afternoon we will navigate through more intimidating rapids, including Big Drop 3, Satan's Gut and Little Niagara. There may be stops along the way as the guide scouts the rapids to find the best route through the churning whitewater. We will pull off the river. After we recreate our riverside oasis, guests are welcome to kick back, relax and relive the day's adventures over and over again as the evening deepens and a bright canopy of stars replaces the blue sky. Traditionally, this last night is a "Dress Up" night. Anything goes, from formal wear to clown outfits with floppy hats. Guests are not required to participate, but are welcome to use their imagination and help celebrate an amazing trip. Your final day of rafting begins with hot coffee, tea or hot chocolate followed by a delicious breakfast, prepared by your guides. This morning we will pass through the final rapids. We may have some opportunities for hiking in some of the canyons previously lost to Lake Powell's waters, but accessible now that the waters in the lake have dropped. Clearwater Canyon and Dark Canyon are guide favorites. We'll climb back aboard the boats and follow the Colorado River as it pushes its way into the calm waters of Lake Powell. Here we'll be in the deepest part of the canyon, surrounded by nearly 2,000 foot cliffs. We'll see the Dirty Devil River and Piano Leg Arch. We'll motor off of the lake and pull off near what used to be the Hite Marina on Lake Powell. You will be escorted to the landing strip for your return flight to Moab. As you take this scenic flight, watch for the Henry Mountains, the White Rim, the Abajo Mountains, the La Sal Mountains and nearly the entire Colorado Plateau. You will bet met at the Moab airport and transferred back to Moab and the Sheri Griffith Expeditions office where your journey ends. The Cataract Canyon trip starts outside of Moab in Southeastern Utah. The rapids in Cataract Canyon are formed from the meeting of the Green River and the Colorado River in the heart of Canyonlands National Park.The end location is 4 hours from Moab at Hite Marina on Lake Powell. The views in Cataract Canyon are hard to even imagine. In May and June the Whitewater in Cataract Canyon can be some of the largest on Earth. 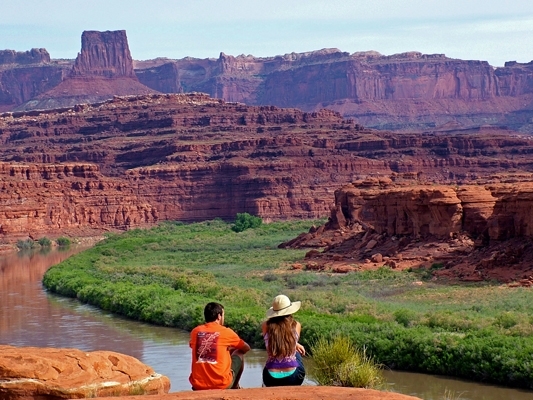 The Best parts to see of the Colorado River in Canyonlands National Park from the river. 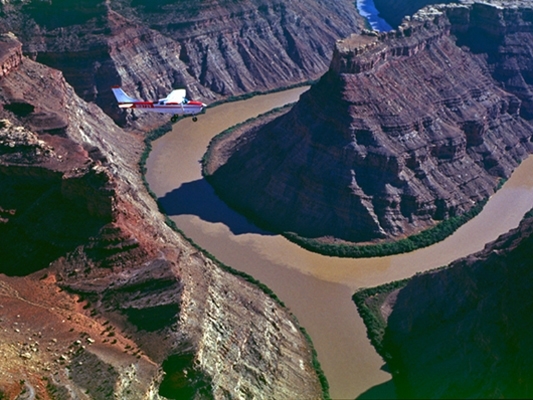 The Cataract Canyon Trip end with a scenic flight back over Canyonlands National Park and the Colorado River. There are many places to explore allow the Colorado River. A trip for couples, families and friends. 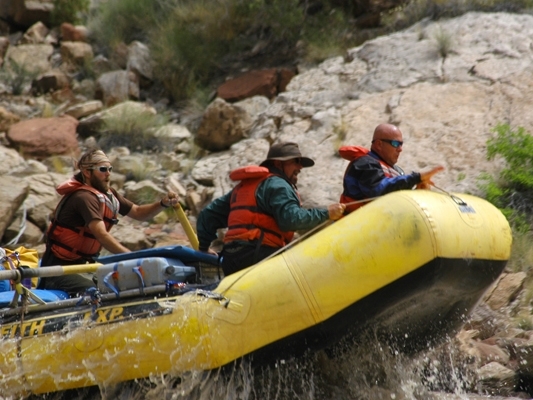 Cataract Canyon Rapids offer fun and excitement. 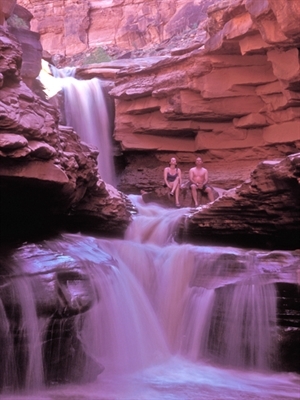 Indian Creek Falls one of many great hikes in Canyonlands only reached from the Colorado River. Please print, sign and return the required forms (for each person in your party) to our office by email, fax or mail at least 45 days prior to your trip. Canyonlands National Park: Canyonlands National Park preserves a colorful landscape of sedimentary sandstones eroded into countless canyons, mesas and buttes by the Colorado River and its tributaries. Arches National Park: Arches National Park preserves over two thousand natural sandstone arches, including the world-famous Delicate Arch, in addition to a variety of unique geological resources and formations. Dinosaur National Monument: Dinosaur National Monument protects a large deposit of fossil dinosaur bones--remains of the so-called "terrible lizards" that lived millions of years ago. 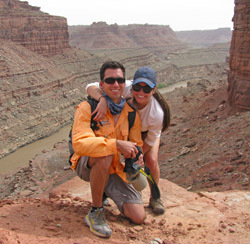 Moab Travel Council: A great resource on Moab area trails, hotels, and other great things to do in Moab. Sheri Griffith Expeditions has a NO REFUND policy. Since you have reserved space for which we have a limited number of seats, our non-refundable policy applies in every instance. There are no exceptions for any reason, so we highly recommend that you purchase Travel Insurance to protect your vacation investment. Please take some time to visit the following website www.travelinsure.com/affiliate/selecthigh.htm?32219, which contains information about Travel Insurance. There are several easy ways to make a reservation. Easiest is to click on the “book online” button on your trip or at the top of the screen. You can always give us a call at 800-332-2439. You can also download Reservation PDF and fax it in (435)-259-2226 or mail it to us at Po Box 1324 Moab UT 84532. For 1 day trips full payment is required at time of booking. For multiday trips a non-refundable $300/person deposit is required at the time of reservation. The balance is due 45 days prior to departure. After making your reservation you will receive a reservation packet that will include a packing list, helpful travel hints, travel insurance information, a beverage request form, and a guest registration form. Please fill out the guest registration form and send or fax back quickly. If you find you are unable to participate in the trip that you booked, but would like to transfer your trip to the following year, there will be a charge of $300 per participant if the change is made at least 3 weeks prior to your departure date. We make every effort to follow through on our plans. However, we reserve the right to make changes in the itinerary or possibly cancel a trip if necessary including but not limited to weather conditions, water fluctuations, insufficient reservations, changes in international relations, or other factors beyond our control. If cancellation is necessary, your money will be refunded. Our financial liability shall be limited to the amount actually paid and shall not be extended to cover any other costs incurred by the trip member. The evening before the trip we meet at our office (2231 South Highway 191) at 5 pm (MDT) in Moab for a trip orientation. Here you will learn what to expect and prepare for, receive your dry bags, sign the Assumption of Risk forms, and get a chance to ask any last questions. If you are not going to be able to make this please let us know ahead of time. If you would like any personal beverages while on the river, i.e., sodas, beer, wine, etc., you can bring them with you the morning of departure and we will place them in iced coolers. We provide some sodas, water, lemonade and Gatorade mixes and tea, juice and coffee in the mornings. Guests often ask whether gratuities are appropriate, and in what amount. If you feel your guides have provided a very special trip for you, a gratuity may be left with the trip leader and will be shared among the crew. Entirely discretionary, anything between 15% and 20% of the trip cost is a general tipping guideline. If you plan to tip, remember to bring a personal check or cash—ATM’s are hard to find in the backcountry! PLEASE, do not make out checks to Sheri Griffith Expeditions. If you are writing check please make it out to the Trip Leader. NOTE: we cannot take credit card gratuities. If you are of an adventurous spirit and in reasonably good health, you should have no problem enjoying any of our trips. It’s not necessary to be an athlete to participate in a river expedition. However, It is several hours to the nearest medical center. If you take medication you should bring a good supply and inform your guide of all medication that you are taking. When you meet your guide, you should discretely explain any medical conditions you may have or be concerned about including allergies to bee stings, etc. Each guide carries a first aid kit and will need to know if specific medicines should be stored. It’s also helpful to know about other health issues when planning activities for the day. Pregnant women and anyone with heart trouble should have their physician’s approval before taking a river trip. We maintain an excellent safety record, since 1971. However, all outdoor experiences involve risk and we all must recognize that accidents or illnesses may occur. We cannot guarantee your safety. We place final responsibility for your safety firmly on your shoulders where it belongs. You have to pay attention to what you are doing. 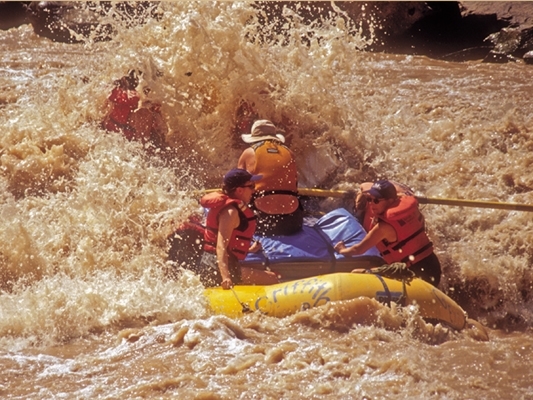 Mother Nature controls the water level, the weather and the elements, so there is a risk involved in rafting and camping. Before your trip departs, you will be asked to sign an Assumption of Risk and Release Form. We assume no responsibility for injury to trip members, their personal belongings or, for time and expense incurred. We strongly recommend Travel Insurance, which covers vacation losses and accidents and provides a refund if you have to cancel your trip. We have a gated parking lot at our office for your vehicles while you are on the river. We also have a safe room for luggage and valuables while you a re on the river.